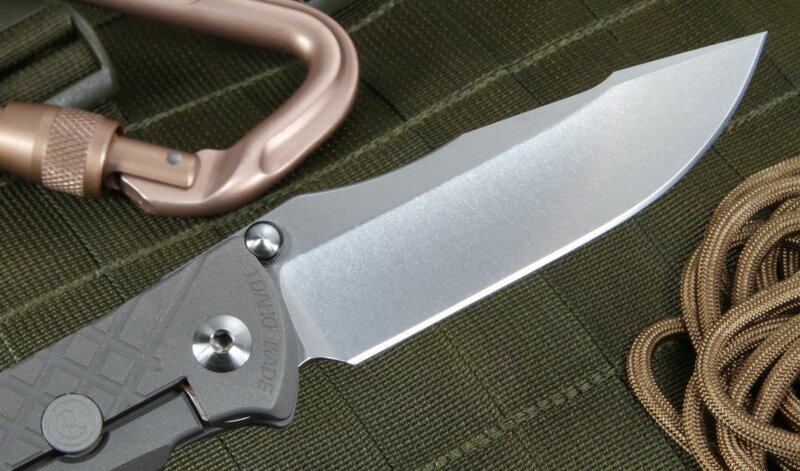 The Chris Reeve Umnumzaan tactical folding knife, nicknamed the Zaan, is ideal for hunters, service members, and outdoorsmen. In Zulu, the word umnumzaan means 'the boss'. This handy knife has a drop point blade shape with hollow grinds that are razor-sharp. Often times the drop point umnumzaan is referred to as the regular or standard blade shape. While closed, the knife is 4.77 inches long. The blade itself measures 3.675 inches and is made out of stonewashed stainless S35-VN steel. On the Rockwell hardness scale, the steel used in this knife is an HRC 59-60. This American-made steel has superior edge retention and is tough as well, resulting in fewer instances of chipping. The top of the blade spine has a thumb rest with machined jimping that provides the user with a solid grip. 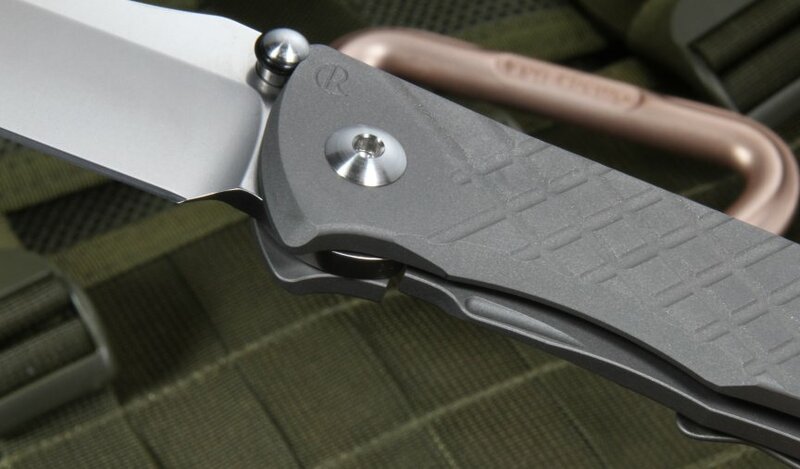 The Umnumzaan folding knife has high pivot strength. The knife has a lock bar stabilizer mechanism, with the CRK logo machined on the face, that prevents over-extension of the frame lock bar. The knife also features a ceramic lock bar interface for increased lock life over a standard titanium frame lock. The ceramic ball is much harder than titanium and allows for much less wear and lock movement over a lifetime of use. The ceramic ball also serves as a detent mechanism to keep the knife in the closed position. It's a solid mechanism that increases the safety and lifetime of carrying this knife. The frame lock bar is finished nicely with a machined grove that allows for increased purchase on the lock bar when closing with your thumb. 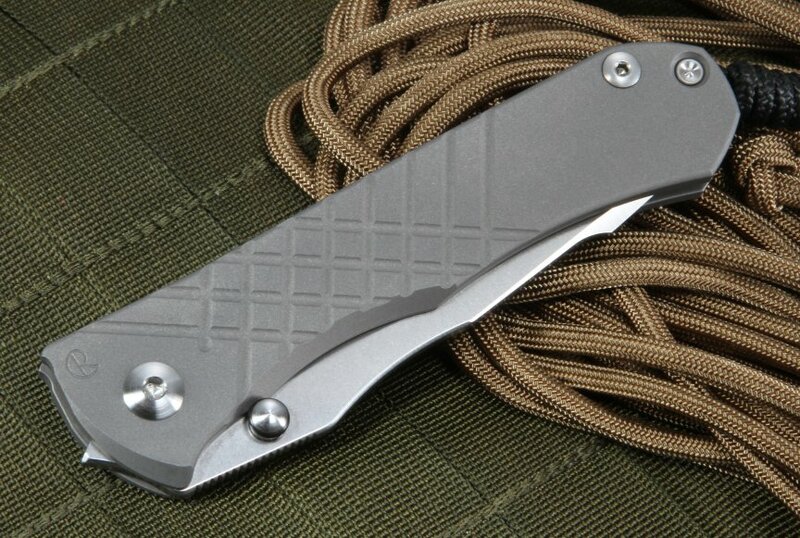 The handle of the CRK umnumzaan is made out of aerospace-grade titanium, which is a lightweight material. In comparison to other knives of a similar size, this innovative knife is extremely reasonable weight, weighing in at 5 oz. When closed the knife has an extension of the blade that functions as a glass breaker. 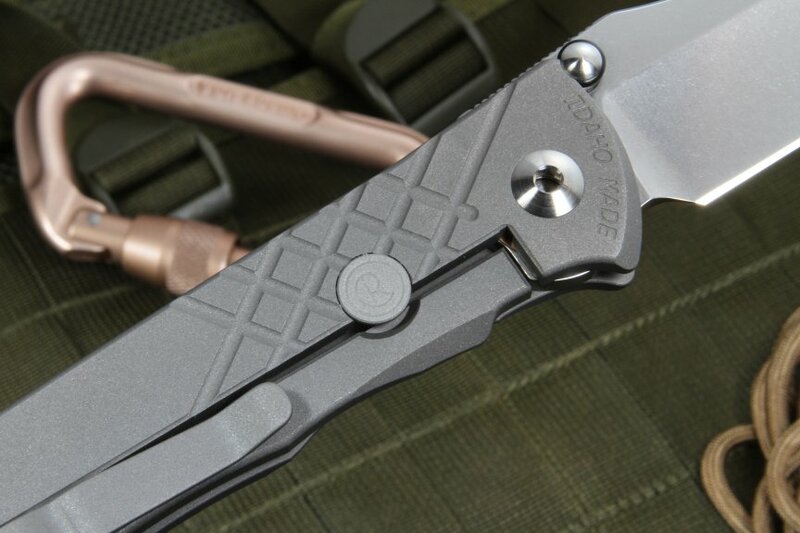 Another reason the Chris Reeve Umnumzaan tactical folding knife lasts longer is it has perforated phosphor bronze washers that decrease friction and hold onto lubrication longer. The knife has a new style pivot that makes the knife extremely strong under torsional tension. The knife is completed with a black cord lanyard attached to a rear spacer on the knife. 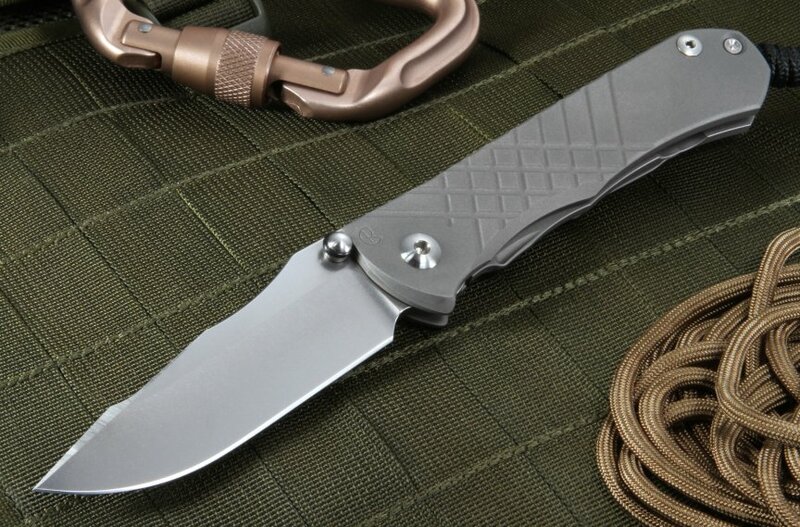 If you order the Chris Reeves Umnumzaan tactical folding knife from KnifeArt, you will enjoy free shipping on a U.S. order. We will also process and ship your order within one business day, so you can receive your new knife as quickly as possible. It's a wonderful and great EDC. Extremely sharp, practical and perfectly finished, it's a great piece. CRK makes great knives and KnifeArt gives outstanding service. Knife arrived and it was perfect. Love the knife. It is a excellent companion to my small Sebenza. This is my first Chris Reeves knife and I was looking forward to receiving and examining the knife. It is a very well made, high quality folding knife. I have several Microtech knives, one folding knife and a OTF Scarab. It took me a while to figure out the method used to open the blade one handed. After I figured it out it works quite well. Overall I am very happy with this purchase. I got the Umnumzaan as a birthday present for my father. Just wanted to say thank you to everyone at Knife Art for processing my order so quickly and shipping it all the way to the Philippines. After a delay of a few days (no fault of yours, things just move really slow over here), I finally got to unbox the Umnumzaan and couldn't resist trying it out. Now I know what all the fuss is about, it's really a work of art - now I want one for myself too! I am very satisfied with this purchase and the awesome customer service. I'm a very happy customer and I'm pretty sure I'll be back to purchase more items in the future. Thanks! 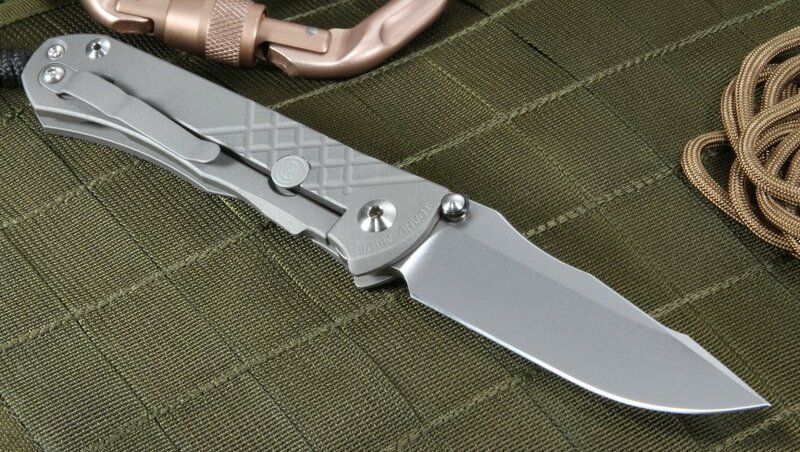 I love the Chris Reeve Umnumzaan. It is a work of art. The moment I held it in my hand, I could feel the quality and years of experience that has gone into the design and craftsmanship of this knife. To me, Chris Reeve knives are minimalistic works of art. If something doesn't have to be on the knife, it won't be there. Lesser pieces involved means easier, quicker maintenance you can perform on your own knife. Everything on this knife is honed down to a precision size. The scales are as slim and as small as the need to be to contain the blade when it is folded, yet maintaining maximum comfort and grip in your hand. Bonus point! CRK has also improved the new packaging that this blade has come in, which includes a complimentary tube of Fluorinated Grease and Loctite. Win!